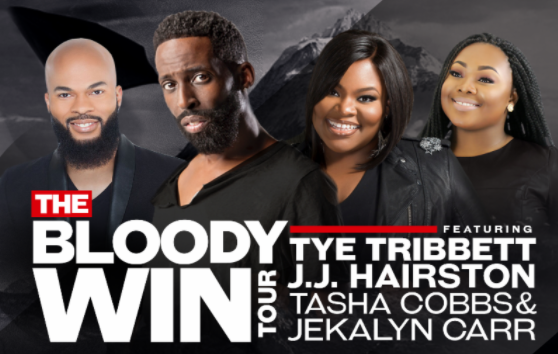 The highly anticipated, “The Bloody Win Tour” kicked off to sold-out crowds full of worshippers Sunday night in Orlando, FL at The Holy Land Experience and Monday night at Bethel Church in Jacksonville, FL. Gospel music superstars Tye Tribbett, JJ Hairston, Tasha Cobbs and Jekalyn Carr ushered in the spirit of God with a 3-hour evening full of their hit music. Attendees of “The Bloody Win Tour” will have the opportunity to partner with tour sponsor “World Vision,” and lend a hand in making sure the nation feeds hungry children worldwide. World Vision is an international partnership of Christians whose mission is to follow our Lord and Savior Jesus Christ in working with the poor and oppressed to promote human transformation, seek justice, and bear witness to the good news of the Kingdom of God. You Deserve It, the sixth album from JJ Hairston & Youthful Praise, continues to soar high on the Billboard Gospel charts. The album is currently sitting at #4 on the Billboard Gospel Top Albums Chart; the single “You Deserve It,” is currently sitting at #2 on the Gospel Digital Sales Chart and #1 on Billboard’s Gospel Airplay chart. The excitement continues this week through “The Bloody Win Tour” in Atlanta, Charlotte and Columbia. Tribbett and Hairston can be seen on The 32nd Annual Stellar Gospel Music Awards airing in national broadcast syndication on 170 stations in over 150 markets around the country from April 14 – May 7, 2017. For more information visit stellartv.com. By popular demand, new cities have been added to the “Bloody Win Tour” including Houston and Memphis. Joining Hairston and Tribbett on select dates of the tour are Tasha Cobbs and Jekalyn Carr. For tour dates and more information visit: BloodyWinTour.com.